Filed to: Booze; Doctors!Filed to: Booze; Doctors! So two weeks ago today, I sort of needed emergency surgery. I thought I was having bad reflux despite my proton pump inhibitors (which I prescribed myself 10 years ago, because doctors are awful patients). The symptoms would last for a few hours, then get better. I set myself up for an upper endoscopy - which entailed calling a GI friend of mine and asking “when can you do and EGD on me?” (did I mention that doctors make awful patients?). But before I could get to that, I developed bloating, and abdominal discomfort that lasted 12 hours instead of the usual two or three. So I went to the ER, where an ER doc friend of mine (yes, I have no physician of my own. What part of “awful patient” do you not understand?) got me a CT scan which showed that most of my stomach was in my chest (it does not belong there), which was causing an obstruction of my gastric outlet and would require surgery. So a friend who is a surgeon took me to the OR the next day, pulled my stomach out of my chest, and sewed the top of my stomach around the bottom of my esophagus in an attempt to prevent the problem from happening again. 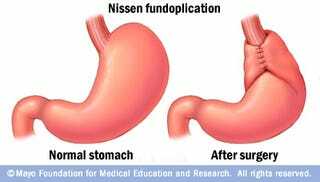 This is called a “Nissen Fundiplication.” Hence the pic above. Near as I can tell, she did an excellent job. And some of my favorite nurses took way better care of me than I probably deserve. I took a week off from work and slowly eased back. I tire out easily and I’m a little stiff, but I am getting better. The worst part has been the diet which is mostly soft foods, no bread, no beef, eat slow, multiple small meals daily. Lots of yogurt, cottage cheese, and tuna salad. Nothing carbonated (mmm...beer), and up until recently, no raw fruits or vegetables, which is most of my diet, no chocolate, which is a problem since most Carnation Instant Breakfast is chocolate, and limited alcohol. But today I had a drink. I had a sazerac, and it was delicious. I used Hudson Manhattan Rye. Then with the turkey meat loaf and mashed potatoes, some 2012 Domaine de Cristia Cotes du Rhone Villages. It’s good to be off the wagon again. Although I have to work this weekend (Being a doctor isn’t all connections and the ability to write prescriptions for controlled substances), but not tonight! Oh, also, I need to know what would be a good gift for someone who really enjoys camping because my surgeon doesn’t drink so my usual gift when a doc friend does me a medical favor is a bottle of Balvenie, and that doesn’t really work for her.